Fall has arrived with cooler temperatures and lower humidity – the perfect days to spend time outdoors. But here in South Florida, allergies persist through the fall. 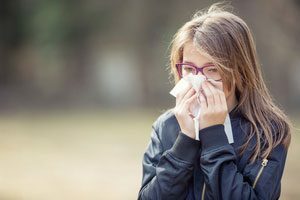 Living in South Florida, long known for hay fever (the common name for pollen allergies), it is important to understand pollen and other allergy causes, like mold and mold spores, as well as symptoms and treatments to relieve the effects. As fall and winter blossoms bloom and the dreaded ragweed, fall’s allergy villain, releases pollen into the late fall. Nearly 75 percent of those with spring allergies will also find themselves plagued with fall allergies as well. Pollen, the microscopic portions of plant seeds, allows plants to fertilize themselves so that even in places where ragweed is not evident, the pollen can travel hundreds of miles via the wind. Pollen is easily inhalable and the culprit behind many seasonal allergies. Mold is another fall trigger, striking in damp areas of your home, office, or garden. Mold, tiny fungi which produces mold spores that travel through the air need food, air, cool temperatures, and water to grow. Fallen leaves and blooms in moist areas are the perfect place for mold to thrive. While everyone breathes mild spores from the air, only some people have allergic reactions to them. If you are sensitive to pollen and mold spores, your body’s immune system reacts treating them as an allergen. The result is sneezing, wheezing, coughing, itchy watery eyes, scratchy sore throat, itchy nose, runny nose, nasal congestion, difficulty sleeping and fatigue. These symptoms are often confused with a common cold, but with seasonal allergies, prevention and treatment is the key. Seeing your doctor can help discover the cause of your symptoms. After discussing your medical history and symptoms, the doctor may recommend a skin or blood test to determine your specific allergens. Be aware of the plants in your area producing the most pollen, staying indoors with pollen is at its peak (late morning and midday). Always check the pollen count in your area with your local weather forecasts. If you do go outside, especially when doing lawn work, always wear a mask to keep from breathing in pollen and mold spores. If you use heat in your home, always clean your vents and change filters before turning it on for the first time in the fall. Using a HEPA filter will also help remove pollen, mold, and other allergens from the air. Using a dehumidifier keeping your humidity setting between 35 and 50 percent. Your doctor can also prescribe medications to help alleviate your symptoms. Steroid nasal sprays can help reduce the inflammation of your nose that accompanies your allergies. Antihistamines can control sneezing, sniffing, and itching, while decongestants dry up the mucus in nose and nasal passages to relieve stuffiness. In more severe cases, immunotherapy using allergy shots, tablets, or drops can help you to feel better. Always check with your doctor when using over-the-counter medications which may not be compatible with your conditions or current prescriptions medications. At Urgent Medical Center, our physicians are here to help you when your allergy strikes. You can schedule an appointment online or walk in and be seen during our normal hours. In addition, Urgent Medical Center provides referrals to allergy specialists when needed within our network of trusted providers. Call on us today, and let us help you with allergy relief.